When encountering poor soil conditions on a building site it may be necessary to transfer the building loads to deeper more stable soils. Determining the most effective and economical solution to this problem will generally involve an investigation of the soil conditions which is typically done with a soil boring. A soil boring is performed to obtain data that provides the soil type, the organic layers and depth to bedrock. 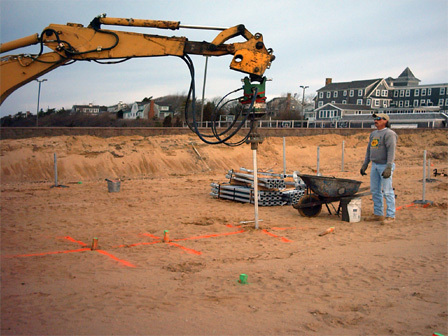 The Helical Pier Deep Foundation System is designed, tested and proven for applications in expansive soils, high water tables, fill areas and other areas where unstable soils require piering. A soil boring can help determine the proper depth for installing piles based on the information discovered within the soil boring report. Once the soil conditions and load requirements are known, the size of the shaft along with the size and number of helixes are determined. Helical piles are steel shafts with helixes welded to them. The Helical pile is installed by screwing it into the ground. On reinforced footing or stem walls, the new construction of Chance helical piers are usually placed every 8 to 10 feet depending upon the load of the structure and the bearing strength of the soil. A two man crew with a skid loader can place over 50 anchors ready for loading in less than one day. Anchors are rated by the building codes for working loads of 10 to 20 tons are typical. Click on Helical pile installation to read about our Elder Services project in Lynn, MA using new construction piers. To learn more about new construction piers for your project, please use our form to contact one of our helical pier installation specialists.